The objective of the paper is to give an overview of the most widely used nondestructive testing techniques in the forest products industry, while focusing on the metods feasible to asses the integrity of built in wooden members. Wood, as a natural material, contains flaws intrinsically (e.g. knots, slope of grain, resin pockets). Fungal or insect attack can also deteriorate the wood structure. The accurate defect detection results in optimized sawing decisions during the manufacturing of forest products, consequently increases the yield of the production process, and the uniformity, and value of the finished product. The properties of wood and wood products show a wider variety than synthetic materials (e.g. concrete, metals, plastics). Therefore, the strength and stiffness characteristics of wood products have to be assessed individually in order to sort the material to grade classes. Traditionally the grading of structural wood products based on visual inspection of defects on the surface of the material. NDT techniques have several advantages. They are more reliable, and repeatable to classify wood products than visual grading. The product can be examined among different conditions (e.g. changing moisture content, during fungal attack etc.) and the effect of the conditions on the properties of the material can be analyzed. Several properties (e.g. density, stiffness, slope of grain, moisture content) can be assessed simultaneously with the combination of NDT techniques. Good examples of the use of NDT techniques for the grading of structural products are the machine stress rating of lumber (MSR), and the ultrasonic grading of veneers. A minimum strength level is required from each element of a wooden structure for structural safety. Traditionally the integrity of the structure is investigated by qualified site inspectors visually. The lack of a reliable and rapid inspection method capable of detecting decayed parts of the members, undoubtedly caused the replacement of a substantial amount of old, but otherwise intact wooden structural elements. NDT techniques minimize misjudgments. Additionally, the condition of the structure during its lifetime can be monitored with repeated measurements at inspection points marked on the surface of the members, and critical parts of the structure (heavily loaded joints) can be examined more closely. The quality evaluation of living trees is required in dense public areas, where the felling of the tree causes severe damages. The continuous monitoring of the health condition of forest areas help foresters to make better cutting decisions and increased yield. Most of the NDT methods used in the forest products industry estimate the strength properties indirectly. After extensive research in the 1950's, highly significant correlation was found between bending strength (MOR) and modulus of elasticity (MOE) of softwoods. There is no physical reason for this phenomena, but both factors are closely related to density. Therefore, the MOE or the density of the material is assessed with the NDT method, and the strength properties are predicted based on the above mentioned correlation. The stress wave method is based on that the speed of sound with the rate of attenuation or combination of these with other factors depend on the same fundamental quantities, that determine the strength and stiffness of wood. In practice a compression wave is generated in the material by tapping it with a hammer (Figure 1). The velocity of this compression wave is calculated from the transit time (t) between two transducers, knowing the distance between the transducers (c = s/t). The density of the wood also has to be measured, and the dynamic modulus of elasticity called stress wave modulus is calculated. The stress wave modulus has a strong relationship with static MOE. The one dimensional model is based on isotropic homogeneous materials, so its validity for wood was proved by comparing the predicted stress wave modulus and the measured static modulus of elasticity. Good correlation was found between the two properties. The longitudinal stress wave NDT technique is inexpensive and requires a small amount of input data (density, transit time). The in situ application of the technique is simple, and does not require any special preparation before usage, therefore it can become an effective tool for structure inspectors. It substantially reduces the error of judgment during structural evaluation. The decay detection is based on a grid system, which is drawn on opposite surfaces of the member under inspection. The stress wave transmitter is placed at one of the grid points, while the receiver transducer is placed at grid point on the opposite side of the member, therefore the measurement is carried out in the transverse direction. At decayed places the speed of sound is significantly lower, than in intact wood. The grid can be further refined at these areas to assess the exact boundary of the decay. The decayed area can be mapped from the transit time data, as it is shown in Figure 2. Fig 2: Typical decay mapping. The stress wave method together with the grid technique were used to assess the decayed part of laminated arches of a school gymnasium (R.J. Hoyle et al. 1978). 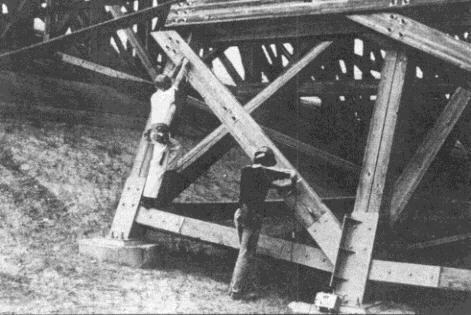 Piers above the water line and bridges (N.J. Volny 1991) were also investigated by the method. Water cooling towers (R.T. Brooks et al. 1991) and wood utility poles (R.F. Pellerin 1978, R.D. Arsenault 1978) were examined too. The biggest challenge was the testing of Trestle (Figure 3), the largest known glue laminated timber (glulam) structure, which was built to test aircrafts in simulated flight situation (C.M. Brown et al. 1985). 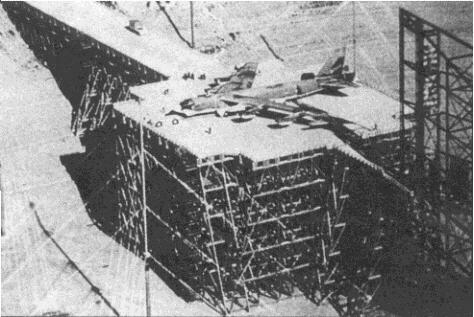 Fig 3: The "Trestle" test stand for aircrafts (3a) and the inspection of the memebers with the stress wave method (3b). In the early 1980's there was a necessity to test the integrity of the structure, because heavier airplanes were manufactured than previously. 484 glulam members were evaluated with the stress wave technique. The main problem with glulam members that the grain orientation of the wood tends to differ at each layer. It was found that the time difference caused by the grain angle is negligible compared to the difference caused by decay. The inspection of the structure stated that the framework was sound, but the deck which was exposed to weather was considerably degraded. It was decided to measure the stress wave characteristics of the structure on a regular basis. The technique is also suitable for the health monitoring of living trees (Figure4.). Standing trees are attacked by root decay. There is no outside manifestation of this decay at the incipient stage. However, the abrupt reduction of the transit time can reveal this internal defect. Approximately when the decay is ten percent of the diameter of the tree trunk, it can be found with a great safety. The health condition of forest areas can be traced, if stress wave time measurements are carried out on designated samples on a regular basis. Fig 4: Decay detection in living trees by the stress wave method. Ultrasound is a high frequency sound at the inaudible frequency range. In case of wood the frequency is between 20kHz-500kHz. This comparatively low frequency range is used because of the high wave attenuation in wood. The acoustic velocity and the acoustic attenuation coefficient is used as strength predictors, and the increase of transit time between two transducers can locate defects. Several standard ultrasonic methods emerged to measure the ultrasonic properties of materials (ASTM E494-89). The two most frequently used methods are the through transmission and the pulse-echo methods (A. Kent 1978.). The through transmission method requires two piezoelectric transducers (mainly quartz crystals) on each side of the subject being inspected (Figure 5). Fig 5: Ultrasonic through transmission method. Fig 6: The "Sylvatest" ultrasonic lumber tester. An electric pulse generator sends a signal through the transmitter transducer. If there is any flaw or check or other defects in the way of the ultrasound, it is partly reflected. The reflected signal will be received by the transmitter, meanwhile the reduced signal by the receiver. The proportion of these two signals can be use for further investigation of internal defects. In the case of pulse-echo method, only one transducer is used. It serves both the transmitter and receiver functions, therefore only the reflected pulse is measured. The time between the initiation and the reflection of the signal is shorter if the wave is reflected from defect boundaries, than from the most further edge of the specimen. In situ measurement where access to both surfaces of the material is restricted, the pulse echo method is the most feasible method. (V.C. Kaerly 1985.). The coupling of the transducers to the material surface is the major problem with the ultrasonic technique. The transmission of the ultrasonic wave through air is very poor. Therefore, the transducers must be adequately coupled to the material being evaluated. If the measurement is carried out with fixed probes at one point on the surface of the wood, a good physical contact is enough by means of applied pressure and proper grease between the surfaces. These requirements make the continuous scanning of large surfaces very difficult. In this case the wood is immersed in a water tank, and two submersible transducers are placed near the piece. The water is used as good ultrasonic couplant. Dry contact rollers are under investigation (E.A. Ham et al. 1991), the inconvenient immersion can be avoided with them. The ultrasound is affected by several environmental factors and wood characteristics. The velocity of ultrasound is increasing as the moisture content of the wood decreases. It is also sensitive to grain direction (K.A. McDonald 1978). The ultrasound three times faster along the grain than across the grain of solid wood. This enables the technique to detect defects, which involves changes in grain direction such as knots and cross grain. Discontinuities in the cell structure or decay slow down the sound propagation. However, certain defects (cracks, splits, checks, worm holes) can not be detected reliably with ultrasonic techniques. The ultrasonic method is most frequently used to asses the quality of lumber, and panel products. Veneers are classified by a continuous ultrasonic grader (Metriguard 2600) prior fabrication to laminated veneer lumber (LVL) beams. LVL beams shows higher uniformity, and consistent bending strength properties, because the better quality veneers are positioned closer to the highly stressed top and bottom face of the beam. In situ ultrasonic grading equipment for the wood industry is marketed under the name "Sylvatest". It takes into account the effect of moisture content and temperature of wood, and modifies the measured ultrasonic parameters accordingly (Figure 6). Hundreds of years of experience that wood under stress emits noises. The basis of the Acoustic Emission (AE) technique is that these noises can be detected by piezoelectric transducers coupled to the surface of the material, and further processing of the signals can reveal what happened inside the wood or panel, similarly like stethoscope discloses health problems. The acoustic ultrasonic (AU) is the fusion of the acoustic emission and the ultrasonic testing method. The AU method injects stress waves into the unstressed material and the propagated signals are received by AE sensors. Subtle flaws even unbounded areas can be detected after the change of the signal is analyzed. The active pulser most of the applications is a piezoelectric transducer exited. When the transmitter and receiver placed to the opposite side of the material the technique is called through transmission, if the same side it is called surface transmission method. The measured wave parameters are different in different studies. The first analysts measured the number of times that the detected signal crossed a pre-set threshold. Therefore, the first machines were counters, they did not distinguished between AE events. The threshold level was set as low as possible to detect the weakest AE events. The background noise was the only limit, because if the threshold was too low the sensors continually detected the noise as AE events. Newer equipments with sophisticated signal analyzers are capable to process and calculate the peak voltage, RMS (root mean square) voltage, energy content, and frequency domain (FFT analysis) of the AE signal. Typical AE signals and parameters are shown in Figure 7. Fig 7: Typical AE wave parameters. The combination of the wave parameters is called the "signature" of the material being evaluated. Those factors that change the characteristics of wood (e.g. decay, crack development etc.) also change this signature significantly, in a successful situation. If the change in signature can be quantified, and the measurement is repeatable the method is suitable to assess the internal properties of wood and wood based products. The fields in the wood NDT field where AE/AU methods are used are fracture mechanics, evaluation of composites, drying control, detecting biological degradation, and wood structure integrity assessment. During fracture mechanics laboratory tests the crack initiation can be envisaged and the crack development can be followed by AE transducers. AE activity was observed at stress level 5-20% of the ultimate strength of the material. The magnitude of the stress level depended on the testing mode (tension, compression). At bending the deflection and AE counts were linearly proportional till the elastic limit, and also thereafter with a less steep slope. Weaker materials containing knots, flaws, splits showed higher AE activity at lower stress level. The location of the defects (AE source) can be determined by multiple sensors. The AE source can be reasonably well located from the difference of the time of arrival from the same AE event. With frequency domain analysis the change in the frequency content can be monitored as the pulse moves through the material. It can predict not only the magnitude, but also the type of the defect (F.C. Beall 1987). The AE activity also wood species dependent, with brittle species causing more AE events. Several type of composite boards (oriented strand board, medium density fiberboard, plywood) were investigated with AE/AU techniques (F.C. Beall 1989). It was found that these materials start to show AE activity at a considerably lower stress level than solids wood. Internal bond (IB) testing was monitored with the AE technique. A clear relationship exists between AE counts and IB strength. The resin level of particleboard is also well correlated with the total AE events to failure (F.C. Beall 1987). The drying rate of solid lumber can be controlled with the AE technique (L. Stephen et al. 1987). The place of the prospective large drying crack can be anticipated with the AE method. Placing several AE transducers around the predicted position of a drying crack, the initiation of the crack can be avoided by controlling the drying environment conditions as the AE activity increases (S. Kawamato 1994). Hardwood can have drying defects more easily than softwoods, so the AE rates of hardwoods during drying is higher. It is possible to dry wood faster with less checking problems within an AE controlled drying environment. Biological degradation is another area where these techniques have a growing prospect. The AE activity increases considerably when the wood is decayed compared to the undecayed condition. AU technique is capable to detect decay in the incipient range. Integrity of wood structures can be evaluated with the AE/AU technique. In the case of glue laminated beams the research focuses on the assessment of bond integrity between laminates and finger jointed elements (R.W. Anthony et al. 1991, F.C. Beall et al. 1991). The connection between the adhesive parameters and AE/AU events are not well understood. However, the AE source is mainly the finger joint, and the experiments showed lower AE stress level for brittle than for flexible adhesives. Unbounded areas can be detected with the AE technique, but the emission from the weakly bonded areas are mainly masked. Further application of AE/AU techniques in the forest products field is the strength monitoring of trussed rafters. The monitoring is based on the Felicity-ratio of the material, which is determined through loading unloading cycles. Felicity ratio of the material is unity (Kaiser effect) if there is no AE event during the reloading until the previous stress level is reached. The weaker the material the lower the felicity ratio. In practice AE sensors are mounted at critical parts of the rafter during the proof loading and the AE behavior is monitored. During the service loading of the rafter as part of a roof system AE event should not occur according to the Kaiser effect, until the stress level is lower or the same as during the proof loading. The integrity of the truss member is doubtful if AE event happens during the service loading. After reinforcement or replacement of the weak truss the effectiveness of the repair can be investigated using the same methodology. The condition of the truss can also be monitored continuously with permanently installed transducers. In spite of the versatility of the AE/AU method, the widespread utilization is impeded by the necessary coupling of the transducers. The coupling material is grease or hot melt adhesive. Sometimes water immersion is used. The drill resistance method is based on that the resistance of a small diameter drill bit as it penetrates into the material at a constant speed correlates with density. A new equipment based on this idea is called the "Resistograph" (F. Rinn 1994). The equipment depicted in Figure 8.a measures the drill resistance of a small drilling needle with a diameter between 1.5 and 3 mm and turns it to density data. The needle is shaped in that way, that deeper penetration does not affect the drill energy consumption through friction (Figure 8). The maximum penetration of the drill is 100 cm. The resolution of the method is so good, that density variations even between growth rings can be detected. The measured density profile can be stored in a computer or printed out simultaneously as the drill penetrates into the material. The method was used for quality control of living trees, built-in members, and utility poles. Dendrochronology is another area where the method is looking forward to successful prospects. This method is quasi nondestructive, since the diameter of the whole is so small, that the weakening effect caused by the whole is negligible. Fig 8.a: The "Resistograph" drill resistance method. Fig 8.b: The needle and a typical density profile plot. The screw withdrawal technique is based on the that the force what a screw probe requires to pull out from the wood is correlates with the density and the bending strength of the material (Figure 9). The method is widely used for the evaluation of wood structures and plywood sheathings. Fig 9: Relationship between probe withdrawal resistance and bending strength. The "Pilodyn" instrument operates on the basis, that a blunt pin is shoot into the wood with a pre-set energy, and from the penetration of the needle the density of the wood, or the degree of decay in the wood can be assessed (P. Hoffmayer 1978.). Different wood species requires different spring energy, according to their density. The instrument was successfully used for evaluating pole decays, or measure the density of standing trees or sawn lumber. The moisture content of the wood although effects the penetration, but with the introduction of correction factors the machine was successfully used in a wide moisture content interval. Disadvantage of the method that only surface properties can be measured. The x-ray technique is used for density measurement of wood. Wood defects which change the wood density substantially (decay, insect damage, splits, checks, knots), therefore sufficiently alter the absorption of the X-ray, can be detected successfully. It is widely used for hardwood lumber grading, dendrochronology, preservative distribution check, and utility pole inspection. The cost of the present systems however hinder the wide spread application of the method in the wood industry. Several isotopes show spontaneous radiation. Usually g-ray emitted by Am 241 is used as radiation source in the forest products industry. The intensity of the radiation changes as it passes through the material. The amount of radiation absorbed depends on the thickness and density of the object. A practical realization of the method is the portable radiological density scanner or RDS probe (Bo Madsen 1994). It can assess the density profile of built in wooden members by measuring the reflected g-rays with a position sensitive detector. The intensity of the reflected ray is proportional to the density of the measured layer. A computer program calculates the distribution of the density over the whole cross section of the member. The instrument was used successfully to assess the rate of decay in building elements. The density distribution of beams hidden beneath the floor was also successfully measured (Figure10). A) volume, measured; B) damping layer. Sniffer dogs were taught to identify dry rot fungus in wood structures in Denmark (Bo Madsen et al. 1989). Although the first results were promising, the efficiency and adaptability of the method require further research. The variability of wood requires the assessment of the material properties on an individual basis. Nondestructive testing (NDT) techniques are suitable to measure certain parameters which correlate to the mechanical properties of wood or wood products. This paper presented the most common areas where NDT methods are frequently used in the forest products industry, namely defect detection, grading of structural products, in-situ wood structure evaluation, and health monitoring of living trees. Special focus was given to the third area, therefore techniques to assess the properties of built in wooden members were discussed in more details. The development of the NDT techniques in the forest products industry is continuous. The most important event of the wood NDT community is the biannually organized Nondestructive Testing of Wood Symposium. The 10th Symposium was held in 1996 in Lausanne, Switzerland, where the elaboration and acceptation of standards of wood NDT techniques were established, as objectives for the following years. The 11th Symposium was in Pullmann, Washington where direction of wood NDT technique development was the main topic. The last NDT of Wood Symposium was organized in Sopron, Hungary in 2000. The main focus areas of wood NDT were discussed and objectives for the new millenium were established.